Why You Should ALWAYS Buckle Up | No Mas Coach! I always find it unbelievable rude when people pay absolutely no attention to the safety demonstration onboard a plane, although I’m guilty of that as I’ve heard it possibly a thousand times by now. It upsets me even more when they show a total disregard for those regulations that are not there just there to annoy us (like Aerolineas Argentinas’ or Vueling’s refusal to allow you to leave your phones on…) but those that are in place to keep us safe. In most cases, they’re stupid simple things like not smoking onboard (although I still can’t believe it was EVER deemed safe…) or you know, wearing your seat belt “at all times, even when the lighted signs are not illuminated”. 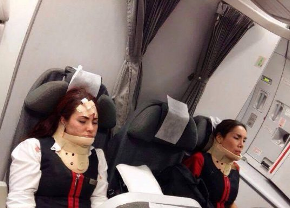 One of the many reasons why wearing your seat belt at all times might be a good idea is better exemplified by seeing what just happened during an Avianca flight from Lima (Peru) to Buenos Aires (Argentina) on June 5th. Flight AV965 took off from Lima 10:36pm enroute to Buenos Aires, where it landed at 4:16am. Somewhere over the Andes range, at 1:11am Peru time, the plane experienced what is being described as unexpected severe turbulence (even though some passengers recount being warned in advance) and the flight resulted in 20 injured people, 10 of which had to be sent to a local hospital in Buenos Aires after landing, according to Avianca in their official Facebook page. All of them were immediately discharged after being evaluated by doctors. They are reporting that some of the injured suffered concussions and bruises. Now, judging by the pictures, some of the injured people seem to be crew members, who one would assume would have been in the middle of the service (unlikely at 1am) or possibly assisting passengers at the time turbulence struck. I assume other passengers might have been hit by objects flying out of the overhead compartments, or service items, etc. But that does leave out some people who were most likely not wearing their seat belts. If you look at the pictures, one of them shows a ceiling panel forced into the fuselage not unlike what they showed in the TV show Lost. You can also see two of the flight attendants wearing neck braces, oxygen masks deployed, ceilings splattered in drinks and the aisles made a total sticky mess with drinks and food. So, while severe turbulence does not normally occur, preventing injuries stemming from it is so ridiculously effortless that you really should be wearing your seat belt at all times. Yes, even when the sign is off. Yes, even while you’re sleeping. Yes, even if it’s uncomfortable. Unless you really feel like headbutting the plane ceiling, that is. Have you ever experienced anything like this? Let us know in the comments! I always wear my seatbelt if I’m scared on an airplane. It’s a simple, safe, and causes minimal discomfort. Turbulence can happen suddenly and without warning. A small price to pay for your personal well being . I have traveled the globe from the United States to Europe (many times, Korea (twice) and India and, while I’ve experienced severe turbulence, have never been injured in the least. If you follow the airline’s rules and suggestions -keep your seat belt fastened at all times, you will arrive at your destination safe and unharmed.